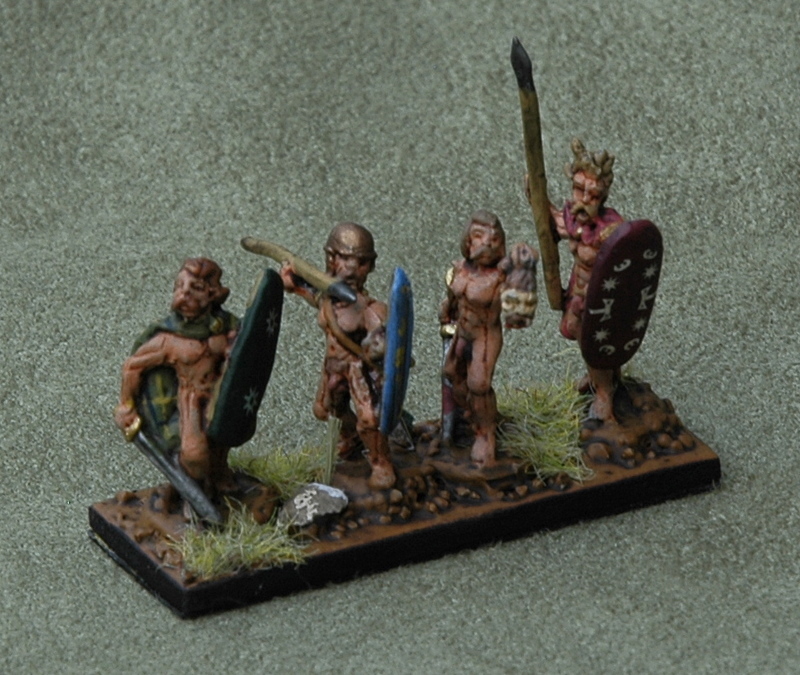 This army (II/35) is made mainly from Freikorp figures (apart from the 2Ps and a 4Ax that are Gladiator, and a 3Ax that is Falcon UK). 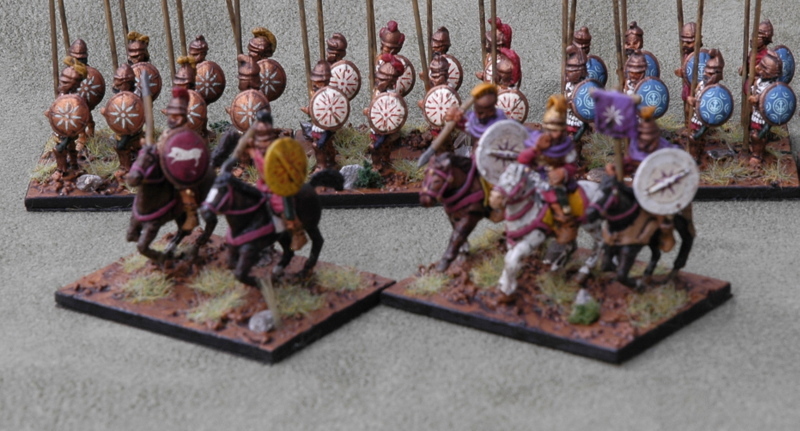 It is a relative rarity, a successor army with no elephant (or knights). It has a solid block of pike, a couple of mounted and some good bad-going troops. Given the weakness in mounted, it is really a matter of getting these bad-going troops to cooperate successfully with the pike to win. Their low aggression makes getting to set terrain a reasonable likelihood. The commander, Philip V, and his cavalry. 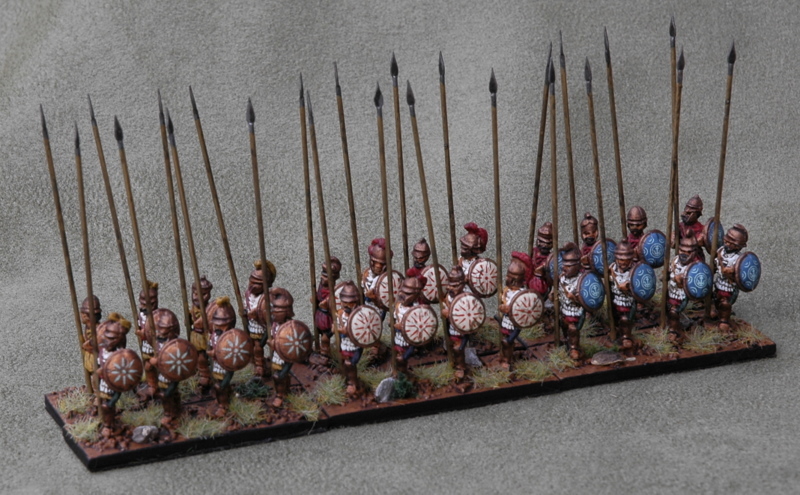 The phalanx, chalkaspides, leukaspides and 'cyanaspides'. The bad-going troops: psiloi supporting Thorakites, Thureophoroi and Illyrians. nice painting, Philipp V its from freikorps personality pack? nice name you give for the kyanaspides but the k its more suitable than c letter, did some greek tell you to choose the name Kyanaspides? you did not want to depict half of the pks as Chalkaspides and half as Leukaspides? Thanks. Yes, Philip V is from Freikorp. The Cyanaspides are a joke name. I painted those elements first as a test batch and chose the colour of the shield to match the transfer. If I’d gone for half Chalkaspides and half Leukaspides, I’d have had to have one as rear rank for the other. The option I went for is tidier. I can always claim it’s an allied phalanx, if necessary. I made up ‘cyanaspides’ myself, having studied Ancient Greek. You’re right that the ‘k’ is perhaps more consistent, but there is a long tradition in English of Latinizing Greek words. This is no longer consistently done now, if it ever was. I favour keeping that tradition going where possible, but can’t claim to be consistent. I write Achilles and Ajax not Achilleus and Aias.